There was a little scheduling snafu last week. A rough draft of this weeks blog post was accidentally published last Friday. One panicked rewrite later, and all is well… Except there’s no post for this week. Well some quick thoughts realized while training at the gym. Training at the gym is not fun. And that’s because of larp. I have a gym routine. Mostly I get to the gym between 2 and 3 times per week. Tuesday and Thursday are running days. There are a few weeks where sickness or injury prevents a trip. But I still don’t like the gym. Thinking about strengthening my arms and legs for Combat Larp helps motivate me to get to the gym and elevates my opinion of the practice in general. This post is not meant to be disparaging of peoples choice profession or passion, this is an entirely personal opinion (hence the higher than average use of ‘I’). I just don’t like the gym. Never have. Popular sports never interested me in High School, and the gym continues to maintain a similar place in my adult life. But put a sword in my hand, and I will run for hours. I will lift a shield until my arm is sore. Just crafting boffer weapons can be tiring, but I will spend hours crafting gear. Once the activity has to do with larp, I do it willingly and enthusiastically. This is why things like The Larp Adventure Program are so important. Reaching those kids who are not into Football, Basketball, Sportsball, etc. The geeky kid can be athletic as well. It just requires something more interesting than the standard sports. Perhaps this is a key to the popularity of Quidditch? All it would have taken for me to be healthier at a younger age, would have been more larp. So really maybe my issue with the gym is not that it’s something that I don’t want to do, but rather there is something that I would prefer to be doing. 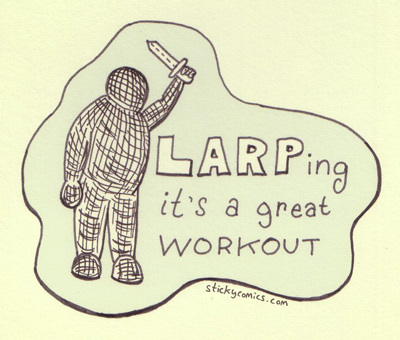 At the risk of sounding like a bumper sticker; I’d rather be larping.